„I think we should go out and help,“ Sheelasha Rajbhandari kept saying, her face scrunched with concern, one hand alternately grasping the other. She stood next to me on the tennis court, fidgeting, where we gathered that Saturday afternoon. Barely an hour had passed since the quake. Reports were intermittent; so were terrestrial waves and shudders. Then someone flashed Dharahara’s rubble on a smart-phone, a sign that the situation in several parts of the city’s old quarters was dire. But we were still in shock, caught in the middle of an Oral History Workshop, unsure where to go, what to do. I lost track of Sheelasha that day, and got busy the following weeks coordinating rapid relief missions to the affected districts. But she showed up at the Yellow House one evening at a gathering I organized, which I had titled „An Initiative for Children.“ Since immediate relief efforts were underway, I felt the need to bring artists, educators, therapists, volunteers and related professionals together so that information could be exchanged and connections made. Who were working with children? What could we do? I asked everyone. Apart from our network of friends and colleagues, those present at the Yellow House that evening included a retired British psychotherapist, Karenza Case and Jess Linton, a young art therapist. Karenza had come to Nepal for a trek in early spring whereas Jess had arrived about a month before the quake, representing Art Refuge UK, in order to work with displaced children. Earlier in the week, both Karenza and Jess had stopped by and we chatted about collaborative possibilities. Thanks to social media, press coverage and word of mouth, people like Karenza and Jess had heard about the The Yellow House and were willing to volunteer their time and expertise. Towards the end of the event, I noticed Sheelasha approach Karenza with a notebook. I learned that Sheelasha and her colleagues, artists who are part of ArTree Nepal, were helping a farming community in Bhaktapur that had been badly hit by the quake. They were making connections and gathering resources. It took me ten more days after the Yellow House event to make it to Bhaktapur, which is less than thirty minutes drive from central Kathmandu. Sheelasha’s colleagues, Hitmaan and Mekh, met me on the roadside, next to a gate which was an entrance to the community, Thulo Bhyasi. Mostly composed of traditional Newari houses, the neighborhood was ravaged and decrepit. A man, standing atop his collapsed building, was yelling at a group of people who were busy throwing piles of brick and rubble from their ruins to the ground. Hitmaan led me across the street to a dingy, local eatery and asked the owner for chiura and eggs. His face was covered with streaks of sweat and dust. He had spent the morning collecting materials for a project. It was time to eat and rest a bit. Picture Clock is a reminder that things change over time, the artists have stated in a working document about this project titled „12 Baisakh,“ the fateful Bikram Samvat date that corresponds to April 25. They plan to use motivation and memory as themes to engage Thulo Bhyasi locals in the rebuilding process. 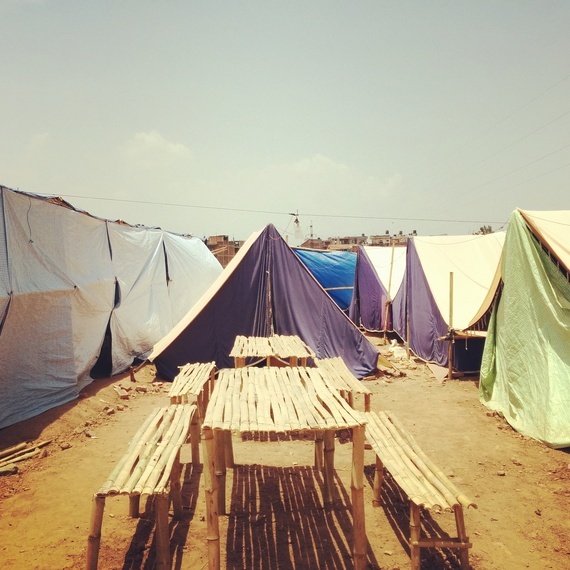 Since the earthquake has transformed homes into zones of destruction that incite fear and anxiety instead of comfort, Camp Hub aims to provide a healing process that will hopefully reconnect locals to their community and help them regain their sense of belonging and attachment. Apart from Camb Hub, ArTree will continue to conduct workshops for children and women during Phase Two. Gleaning from the document and conversations with the artists, Phase One constituted immediate relief and research, along with screenings of inspiring documentary films that are translated into the local Newari language. When they first arrived at Thulo Bhyasi on Day 3 of the earthquake to check on a friend who lived there, Artree felt compelled to return and help in any way they could. They talked to the locals and went on walks, assessing damage and needs. When they witnessed that the farmers, who were camping at a nearby field, did not have a clean, comfortable place to eat, the artists constructed benches made out of locally available materials. ArTree Nepal have been volunteering their time and effort for this project. 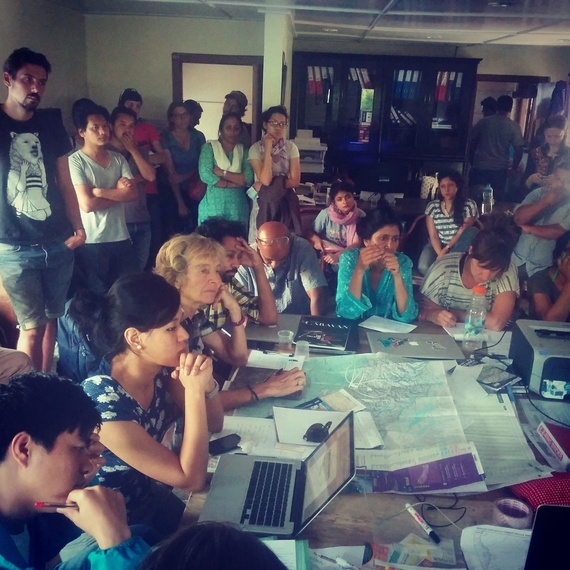 Since the earthquake, they have networked with some organizations to direct relief to Thulo Bhyasi and mobilized local groups to take leadership. „12 Baisakh“ is envisioned as a three to five month project that the artists plan to replicate in other communities. I was happy to hear that Sheelasha managed to take Karenza to Thulo Bhyasi and organize counseling sessions for the women and men in the community. There is a photo in the „12 Baisakh“ document where Karenza is bent over in mid-talk, her shock of blond hair more visible than her features, sitting next to a middle-aged local woman whose eyes are closed, and her face, ironically, is blurred and out of focus.